Since September 1st. 2007, Josef Holz has been responsible in his role as Managing Director for Sales Eastern Europe, for the U.I. Lapp GmbH in its function as Management Company for Europe. 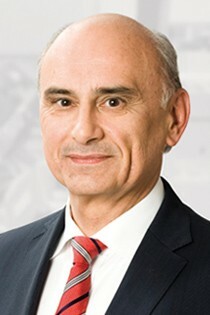 The university trained economist and qualified lawyer ‘diplomatus rerum politicarum‘, Josef Holz, who was born in 1954, initially held a post at Robert Bosch GmbH, before leaving his post as Head of the Commercial Divisions and Global Sales Logistics to join an internationally-operating measuring instrument manufacturer. Six years later he took up the post of Managing Director for Sales and Commercial Divisions for the holding company of a corporate group in the capital goods industry. Since October 1st, 2002 Mr. Holz has been in charge of the Europe Division at Lapp Holding AG. He took up the post of Managing Director at Lapp Systems GmbH at the same time. "The expansion of the global presence of LAPP, the LAPP brands and the LAPP services; for the benefit of our customers, no matter where they may need LAPP”, this is our goal.